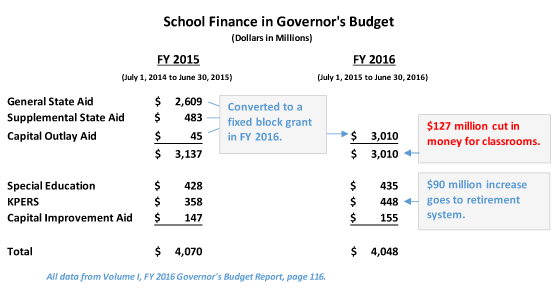 The governor’s budget recommends significant school finance cuts for FY 2016 that would directly reduce money going to Kansas classrooms. The recent cuts that the governor imposed on the approved FY 2015 budget sets into motion some of those reductions right now. The chart below outlines the governor’s budget proposals released in mid-January. In the chart, note: The school funding proposal converts classroom support — general state aid and supplemental state aid — to a block grant that would be $127 million lower in FY 2016 than in the current year. 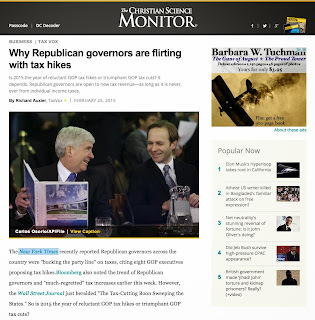 However, soon after releasing his budget proposal, the governor used his “allotment” authority to unilaterally cut general state aid by $28 million in the already approved FY 2015 budget. That reduced general state aid from the $2.609 billion shown in his budget and in the chart above, to $2.581 billion. The $28 million FY 2015 cut became a head start on the reductions proposed for FY 2016. Also note: The $90 million increase for retirement system funding (KPERS). The state covers the employer share of retirement contributions for all education personnel and has committed to increase that amount by about $45 million each year, until KPERS is in a more sound financial position. Last December, the governor broke that commitment by using his allotment authority to cut out the FY 2015 increase, but he then proposed a $90 million increase in FY 2016. Money for retirement contributions is important, but cannot be used to fund any classroom costs. School districts receive the KPERS money from the state and immediately remit it to the retirement system. When added into the grand total, the KPERS funding increase hides a portion of the cut applied to classrooms. Remember, though, that as bad as a $127 million cut to classrooms may sound, the situation could easily get much worse. The governor’s FY 2016 budget is predicated on his proposal for the state to raise $433 million in additional revenue from new cigarette and alcohol taxes, a large transfer from the highway fund, and elimination of income tax deductions. In this legislative session, approval for new revenue is hardly a sure thing, but without it, the cuts will be deeper. Make no mistake, the governor has proposed to cut the state’s investment in education as a way to balance the state budget, not because it helps schools. None of these classroom cuts would be necessary if state income tax revenue had not dramatically plummeted. Kansas needs a stable, ongoing source of revenue that matches normal, reasonable expenses. We are far from that now. — This blog was first posted on RealProsperityKS.com on Feb. 18.